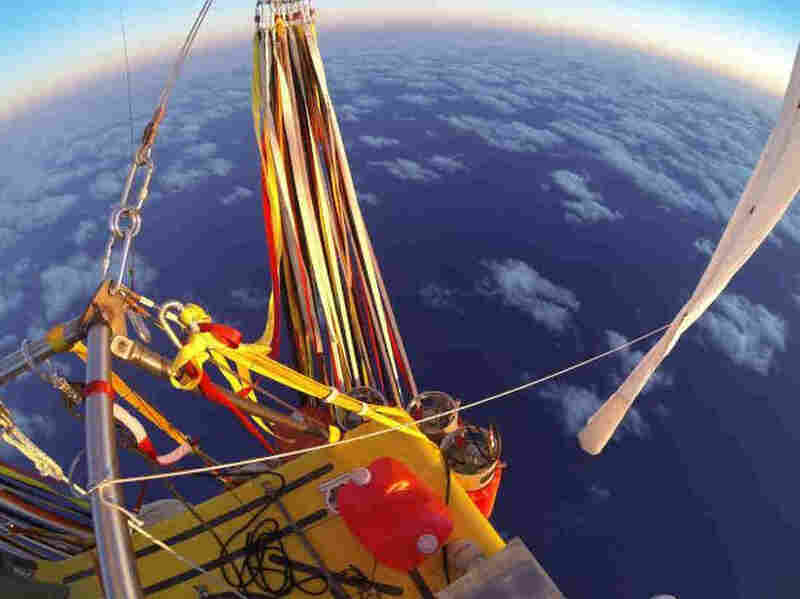 Balloonists Crossing Pacific Set Distance Record : The Two-Way American Troy Bradley and Russian Leonid Tiukhtyaev, flying east over the Pacific Ocean, surpassed the previous record of just over 5,200 miles set in 1981 for gas-filled balloons. In this photo provided by the Two Eagles balloon team, Troy Bradley of New Mexico and Leonid Tiukhtyaev of Russia set off from Saga, Japan. Two balloonists have unofficially left a distance record in their wake as they head east over the Pacific Ocean. They lifted off from Japan, and now they're getting ready for a landing on Saturday somewhere on Mexico's Baja peninsula. When the record was set, applause erupted at the Anderson-Abruzzo Albuquerque International Balloon Museum in New Mexico, which is serving as mission control for the flight. "[Under] the rules established for the Fédèration Aéronautique Internationale (FAI), the international air sports federation, an established record must be beaten by at least 1% of the previous distance. At 5:16 PM MST (0016 UTC), Two Eagles passed through the 5,260 mile (8,467 km) mark, besting the distance required to establish a new record. "We would note that the Two Eagles team has not 'broken the record.' That will be determined by the U.S. National Aeronautic Association, followed by the FAI, after a meticulous process of documentation and review that may take several weeks or months." The team is also trying to surpass the flight duration record of 137 hours aloft for a helium balloon, set in 1978 by a team crossing the Atlantic Ocean.